TRAP (targeted regulation of abortion providers) ordinances place medically unnecessary restrictions on abortion care that do not exist for procedures of similar complexity and risk with the ultimate goal of shutting down abortion clinics. Anti-choice politicians pass these ordinances under the guise of protecting women’s safety and health, including seemingly benign requirements like wider halls in abortion clinics or requiring abortion providers to have admitting privileges at a nearby hospital. However, there is no medical evidence to suggest that any TRAP restrictions improve patient safety. The actual and intended consequences of TRAP ordinances are to make it more difficult for abortion providers to practice and, ultimately, force abortion clinics to close. This strategy has been used effectively in states across the country; anti-choice activists are now working to further decrease access to abortion by passing similar regulations on the local level. In the spring of 2015, Planned Parenthood finished construction on a health center in El Centro, CA, in the southeast corner of the state near the Mexican border. When the facility applied for a standard transfer agreement with the El Centro Regional Medical Center, a hospital owned by the city, hundreds of anti-choice activists protested outside the hospital’s board meeting, demanding that the transfer agreement be denied. In response, the city commissioned an independent review to investigate the agreement’s legality, which found that El Centro Regional Medical Center had no legal right to deny a transfer agreement. More than 2,000 anti-choice protestors, supported by National Right to Life and cheered on by anti-choice leaders like Michele Bachman and Alveda King, then attended a City Council hearing to demand that the Council take control of the hospital’s decision and deny the transfer agreement. The City Council resisted the pressure, citing the results of the legal review and state law that protects access to abortion, and upheld the transfer agreement. However, just before the health center was set to open in early April, El Centro’s Fire Chief reclassified the building as an outpatient surgery center and denied it fire clearance, stating that the building needed to meet more burdensome safety standards. Planned Parenthood, pointing out that no other abortion clinic in the state was required to meet such burdensome requirements, threatened to file a lawsuit against Fire Chief Hubert and the City of El Centro. On May 5, several weeks after the planned opening, city officials granted the facility a temporary occupancy permit, enabling it to open with limited hours to provide family planning services, excluding abortion. A week later, just before Planned Parenthood filed their lawsuit, the City issued clearance for the clinic to fully open. While their fire clearance is still subject to a final review from the State, Planned Parenthood of El Centro will begin offering abortion services as soon as it receives its license from the California Department of Public Health. RH Reality Check covered the conflict. Read more in-depth coverage of El Centro’s City Council hearing. Read about the end of conflict and opening of the clinic here and here (behind a paywall). Visit the health center’s website. In December 2015, the San Antonio City Council amended its zoning regulations to require ambulatory surgical centers to receive City Council and Zoning Commission approval before opening in neighborhood commercial or light commercial districts. A coalition of anti-choice activists and organizations had been advocating for this change for some time due to the recent relocation of a Planned Parenthood abortion clinic to an ambulatory surgical center, a move necessitated by Texas law HB2. Around 40 anti-choice activists testified as others stood in the back of the room holding large signs with graphic photographs. The measure passed 7-4. It will have no impact on the Planned Parenthood facility, which has already relocated, but will impact any future ambulatory surgical centers seeking to establish themselves in the community. Read about an August Planning Commission meeting where anti-choice activists advocated for this change at KSAT. San Antonio Express News covered the Council’s consideration on December 3 and then passage on December 17 of this measure. Listen to the December 3 City Council meeting. In December 2014, a St. Joseph County Council Committee considered approving an ordinance that would require local abortion providers to obtain hospital admitting privileges. Some pro-choice advocates in the area recognized this as a direct attack on the county’s one abortion provider, who did not have admitting privileges and likely would have been unable to get them. The committee held two hearings on the proposed ordinance, with testimony from pro-choice and anti-choice advocates. They ultimately chose not to pass the measure on to the full County Council in December, but revisited the issue in February 2015. The Council held a hearing on the bill that lasted over six hours, with five hours of public comments. Pro-choice advocates came out in large numbers to voice their opposition. At the end of this hearing, the bill was defeated 6-3. Read about the committee hearings here and here. Read about the committee’s final decision on the proposed ordinance. Read about the ongoing discussions of the proposed ordinance in St. Joseph County here. Read about the City Council hearing and the bill’s defeat here and here. Read the amended bill (which did not pass). Read about the anti-choice group St. Joseph County Right to Life’s response to the bill’s defeat. The St. Joseph County Board of Health released a statement opposing the bill before its defeat. In February 2014, Manassas, VA City Councilman Marc Aveni proposed a change to the city’s zoning ordinance that would require new clinics to apply for a “special use permit.” This change would have singled out abortion clinics by rezoning them in such a way that, in order to open, they would need a “special use permit” subject to public hearings and city council approval. The City Council instead approved a motion asking city staff to research the issue and report back in March. At the March meeting, the Manassas Department of Community Development recommended that the City Council deny the changes and proceed with already-laid plans to conduct a comprehensive review of the city’s zoning code. They also noted that the specific change proposed by Councilman Aveni should not be approved because of its potential impact on a constitutionally-protected right. After hearing testimony from many people on both sides of the debate, the City Council voted to reject the measure, 4-2, and proceed with the planned review of the zoning code. The debate over a change in zoning codes resurfaced in March of 2015, when city planners were in the process of their comprehensive review of the city’s zoning codes. Councilman Aveni again proposed requiring women’s health facilities to obtain a special use permit as part of their reclassification as a medium-sized medical facility. His proposal was also similar to a zoning change in Fairfax, VA that led to the shuttering of NOVA Women’s Healthcare. The new ordinance passed with a 4-3 vote, the tie broken by Mayor Hal Parrish. Manassas’s only abortion clinic, Amethyst Health Center for Women, was not grandfathered in and would have likely been denied a permit and forced to close. Amethyst closed in September of 2015, when its owner and provider retired and was unable to find a replacement. At the time of sale, Amethyst’s owner was told by their legal representation that the clinic was being purchased by a group of medical office investors; in fact, the new owner is the Blessed Virgin Mary Foundation, who works with a crisis pregnancy center (CPC) that has long operated next door to Amethyst. CPCs pose as full-service reproductive health care facilities in order to manipulate women with anti-choice propaganda and medically inaccurate information. The CPC had Amethyst’s phones forwarded to their office within a matter of minutes after the sale, and they are actively deceiving women who call Amethyst’s phone number seeking abortion care, telling patients that they are “taking calls for” the shuttered clinic. Read more from Inside Nova. Read background on this issue from NARAL Pro-Choice Virginia. Read NARAL Pro-Choice Virginia’s press release in response to the City Council’s rejection of Councilman Aveni’s measure. Read about the City Council’s decision from Potomac Local. Read about the controversy surrounding Councilman Aveni’s proposal. Read coverage of the ordinance’s passage here and here. RH Reality Check also covered the ordinance and its effects on abortion care availability. Read about the closing of Amethyst Women’s Health Center here. Read about the purchase of Amethyst and anti-choice attempts to deceive callers in Slate and The Washington Post. In an effort to meet the requirements of an unnecessary and restrictive TRAP ordinance passed in Virginia requiring abortion clinics to be regulated as Ambulatory Surgical Facilities, the NOVA Women’s Healthcare clinic in Fairfax, VA applied to the City Council to move to a new location and retrofit it to meet the new specification. In response, the Fairfax City Council began looking into their own zoning regulations, and those of nearby towns, in an attempt to reclassify abortion clinics. They ultimately voted to create a new category of “medical care facility,” meaning that abortion clinics will need to obtain a special use permit at a cost of $4,800 and go through a detailed approval process requiring approval from the City Council to pass. NOVA Women’s Healthcare’s permit was denied and the clinic closed in June 2013. NARAL Pro-Choice Virginia coordinated the response to these zoning regulations. Read background on the ordinance and its passage. Read more about the vote at RH Reality Check. 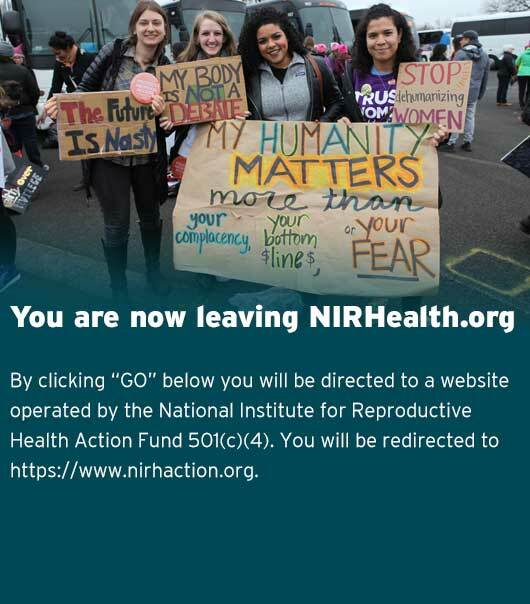 Read about the response from the pro-choice community. Read about the of NOVA Women’s Healthcare. Read about the ongoing efforts from advocates and the community to protest the City Council’s decision.